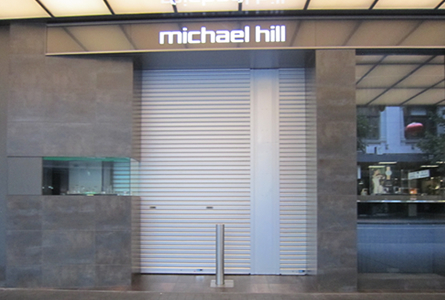 A strong and attractive all-purpose solid aluminium roller shutter door designed for a wide range of applications including serveries, counter tops, kiosks, shop fronts, arcades, cabinets and even residential garages and carports, in fact all areas that require concealment from view. This roller shutter is dust and vermin proof, easy to clean and meets food hygiene standards. Extruded aluminium interlocking door slats fitted with nylon endlocks to control lateral movement & reduce noise & friction. The screen can be perforated for vision or ventilation if required. Extruded Aluminium Section incorporating a mohair brush strip underneath to prevent damaging the floor or counter top surfaces. Bottom rail is designed to retract flush with ceiling or lintel when door is opened. Two point double sided deadlocking for security allows keyed access from either side of door. Internal thumb turn locking optional. Extruded Aluminium channel 30mm wide x 50mm deep, fixed conventionally behind door jambs or recessed into wall. Flared at top for smooth entry at screen. 200mm diameter door drum for minimal deflection of door screen across opening.Torsion springs calculated to balance screen weight for lightweight operation. Several options available in single or 3 phase models. Additional clearances required, refer to separate data sheets. Optional extras include UPS Battery Backup (single phase), External Keyswitch & Remote Control. Removable mullions are used to separate multiple doors in cases of very wide or angled openings when full access is required.The door tracks being removable leaving opening unobstructed. Satin Silver Anodised Aluminium. Powder coating of a wide range of colours available as an optional extra. Maximum recommended size for manual doors is 3600 wide x 3000 high. Contact us for recommendations over this size. Scotty Doors has a continuing programme of development and reserves the right to alter specifications at any time without notice.